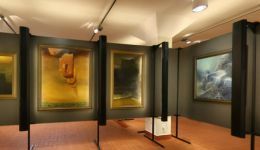 The gallery begins with co-called Sanok chamber where are presented, apart from outstanding photographs from the 50s, early works created in abstract manner along with the set of unique pictures painted on glass and equally interesting sculptures. Next room, being faithfully reconstructed Warsaw studio, familiarizes the visitor with suggestion of the space where this outstanding works came into existence. It gives the possibility of direct penetration of intimate, everyday world of the master, his way of thinking and creating. Wide spectrum of the exhibited works, being presented in drawers of display cases, such as sketches, drawings and graphics coming from various periods, reveal continuous improving of technique and seeking for own, autonomous forms of expression. There is no lack of computer works, although as the most significant are concidered two chambers situated on the lower storeys where there are exhibited the most important paintings of the entire oeuvre.The paintings, through which the artist fully expressed himself (both the ones from the fantastic period as well as from the last twenty years of his artistic work), give the opportunity for a spiritual walking through the labyrinth of extraordinary talent and unlimited imagination. There is also possibility to see an exceptional work – the last painting finished on the day of the artist's death. Multimedia displays, accompanying the exhibition, familiarize us with character of the artist, whereas the resounding music of favourite composers complements the whole show.